The corner of First Avenue and Howard Street had been sitting dark for almost a year, creating a dead spot in an area of downtown Spokane known for its nightlife. That was why Necole Flerchinger and her business partners decided they wanted to bring it back to life. In the spot formerly occupied by the Blue Spark, once a nightlife stalwart, Flerchinger, along with co-owners Ryan Lieuallen and Zach Wirchak, has opened Underground 15. 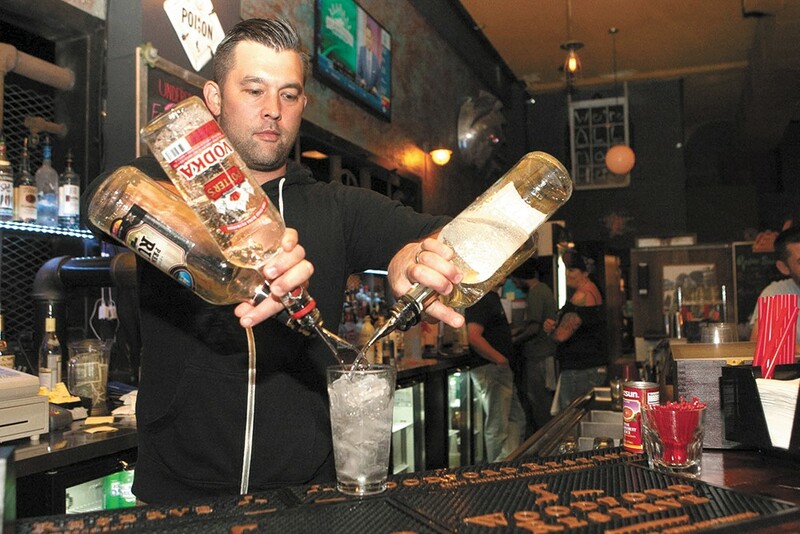 With a new stage and revamped layout, the bar plans on becoming a live music destination for the downtown area, says Flerchinger, who has worked at other area restaurants and bars, including Ugly Bettie's. When that bar closed, Flerchinger teamed up with Wirchak and decided to open a venue of their own. The place needed some work — the floors, the bar area, the plumbing infrastructure and other modifications. It was hardly a painless process. While working on the remodel just weeks before Underground 15 opened in mid-May, Flerchinger tripped and fell onto a piece of steel, severing six tendons in her arm. She was back on the job site a week later. Last weekend, you could find her behind the bar, making drinks for the after-work crowd — getting better, but still healing, she says. What's proved to be less challenging for Underground 15 is its location. When the Blue Spark closed, owners blamed the vacant Ridpath Hotel and the street kids who typically loiter around the area as the reason their business had slowed. Flerchinger says that hasn't been a problem. "We haven't had an issue at all. The Ridpath is going to open soon, and with [the Red Room] and the Wave, that used to be the heart of downtown," she says. "It's unfortunate that we have these little dead spots, so it's important for business owners to come in here."